a birthday trust in purity. in five loose petals above heart-shaped leaves. life as water pours from the spout. and puts it oh so carefully in his pocket. trickle. Another hand wipes her skin. rise in mist, pop in humid air. back onto her bony shoulders. bones bent with the wet and heavy load. Lavender petals lick her skin purple. In her bath, she soaps her wet body. promises into her cupped ear. At 10, she molds her breasts with strawberry bubbles. she pulls the bathtub plug. 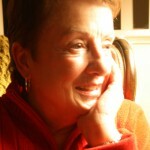 Carol Carpenter's poems and stories have appeared in numerous online and print publications, including: Fjords, Anderbo.com, Barnwood,The Pedestal, Soundzine, Orbis (UK) and Quiddity. Her work has been exhibited by art galleries and produced as podcasts (Connecticut Review and Bound Off). Her chapbook, The Empress of Patton Avenue, was published online by Heartsounds Press. She received the Hart Crane Memorial Award, the Jean Siegel Pearson Poetry Award, Artists Among Us Award and others. She lives in Livonia, Michigan.